“OKAVANGO WILDLIFE SAFARI” is an 11 day non-participation safari that takes in all that the Okavango Delta, Moremi Game Reserve and Chobe National Park offers. From the start of the safari on the banks of the Zambezi and crossing the Caprivi Strip, to the first days spent on the enigmatic Okavango River on a Houseboat and a day where guests can experience the resonant atmosphere of spirituality that inhabits Tsodilo Hills. A fantastic flight into our remote camp in Moremi, to the remarkable Game-viewing that the inscrutable Savuti Channel offers, with the last few days spent alongside Chobe River watching Elephants, to the Safari’s end viewing the splendid Victoria Falls. From recollections of first few nights spent out in the unique water Wilderness of the Okavango Delta, to the moonlit sands of Savuti... these images all combine to leave indelible memories of spectacular Wildlife, of nights passed on //Kabbo Houseboat listening to the flow of the Okavango and the tinkling of Bell Frogs... and of evenings spent around a campfire under billions of stars. Tonight we board //Kabbo Houseboat, based on the serene waters of the Okavango River. Guests depart Livingstone by road transfer (07h00) and we cross into Namibia over the Zambezi River at Sesheke Bridge. After customs and immigration formalities, we make our way westwards, before driving south into Botswana and the town of Shakawe, which is situated on the banks of the Okavango River. //Kabbo is a San Bushman word which is a loose translation meaning “To dream”. The Houseboat operates in the “Panhandle” area of the Okavango Delta, Northern Botswana. This area is recognized as being amongst the quietest and most peaceful in the Delta, due to its remoteness. 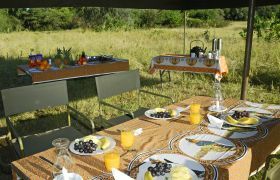 Indeed, there are only a handful of permanent camps and boats operating in this wilderness area - which makes it ideal for our discerning guests. (L, D: En-Suite Houseboat Cabin). Kabbo Houseboat, Okavango Delta. //Kabbo has tender boats which assist in the activities offered. The activities available include fishing, bird-watching, boat safaris and an optional visit to Tsodilo Hills. Tsodilo Hills is a World Heritage Site with the richest concentration of San Rock Paintings in the world. Tsodilo Hills are about 53km southwest of Shakawe in dry, bush-covered and softly undulating landscape. The site consists of four hills that rise abruptly, to about 400m, from the dry expanse of Bushveld. Having been inhabited for about 30,000 years, they're one of the world's oldest historical sites. The Hills are home to more than 4,000 San Bushman paintings - probably the world's most important collection of rock art - perhaps even more remarkable is the resonant atmosphere of spirituality that inhabits Tsodilo Hills. Several walking trails provide helpful routes around the painting sites. Among the interesting paintings are paintings of whales and penguins that suggest contact between the San and other peoples. (B, L ,D: En-Suite Houseboat Cabin). Maun, Sedia Riverside Hotel. Today we take quick and early drive out of the Okavango Panhandle and journey and journey south-west into the frontier town of Maun, to our hotel which has a pleasant eating area with a welcome swimming pool. The afternoon is at leisure at the Hotel, which is situated on the banks of the Thamalakane River. Lunch and Dinner are at guests own expense. Guests are also able to replenish their drinks for the next eight days. (B: Hotel). Our representative who will assist with your transfer from Sedia Riverside Hotel to Maun Airport and onto a shared light aircraft, for an exciting flight to Moremi. Your guide will meet you at the airstrip we take a leisurely drive to our private Campsite in the Khwai River area of Moremi Game Reserve. This region’s diversity of game is astounding and Moremi has quite rightly been rated as one of the best Game-viewing areas in the world. Afternoon Game-drive and overnight camping in Moremi Game Reserve. (B, L, D: Non-Participation Camping). Khwai River,North gate, Moremi Game Reserve. Today is spent on early morning and afternoon game drives. 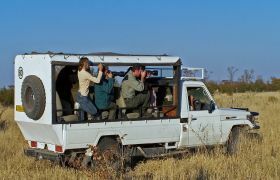 Your guide will generally spend maximum time on game-drives, depending on what is seen, trying to cover as much area as possible. The result of this is guests are given the best chances of seeing a variety of Wildlife - although there is of course, the obligatory siesta during the hottest part of the day. (B, L, D: Non-Participation Camping). Savuti, Chobe National Park. We leave Moremi, crossing the Khwai Bridge to the northern bank of Khwai River. There is sometimes a quick opportunity to buy more drinks in the small village, before making our way to Chobe National Park. Due to the fact that none of Botswana’s wildlife areas are fenced, Game can move freely between these two Wilderness areas, Hippo, Elephant and sometimes Lion are often found on this route. Moving through the Mababe depression, we relocate to Savuti. Game viewing this afternoon takes place along the fringes of the marsh and surrounding water holes. The area is best known for large populations of Bull Elephants-and Prides of Lion that patrol the banks of this enigmatic channel. (B, L, D: Non-Participation Camping). Savuti, Chobe National Park. Again we have the opportunity to spend many hours on morning and afternoon Game drives, as well as an opportunity to climb one of the 5 hills to see San Bushman paintings, an indication that this area has always drawn those who have an affinity to the wilderness. (B, L, D: Non-Participation Camping). Serondella area, Chobe National Park. We journey north toward the Chobe River, the Second biggest river in Southern Africa (Zambezi in the largest). Chobe River is home the world’s largest Elephant herds; large numbers of Big Game such as Buffalo, Hippo and Lion can be seen here. Our private campsite is on a Teak forested dune that overlooks this beautiful river. Game drives are taken in the afternoons and mornings to find the remarkable variety of species that are drawn to this permanent water source. (B, L, D: Non-Participation Camping). Serondella area, Chobe National Park. After an early start, we take a slow drive along the southern bank of the Chobe River, where we can find Chobe Bushbuck and Puku Antelope. In the afternoon, guests might choose to go on an optional afternoon Boat Cruise along the Chobe River-perhaps the last river where one has a fair chance to see Lion and Elephant, Leopard or Wild Dog from the unique viewpoint of a boat. (B, L, D: Non-Participation Camping). We have a leisurely start this last camping morning and say fond farewells to our efficient back-up and camp crew. We head eastwards for the short drive to Kazungula Border Post, where your guide will ensure that your transfer back to Livingstone is seamless. This afternoon is spent exploring one or the truly magnificent sights on earth-the wonderfully beautiful Victoria Falls-300 feet high and over a mile wide! Witness the power of nature as an average of 550000 tons of Water thunders into the Zambezi Gorge every minute. Afternoon at leisure for optional activities (guests own expense). Overnight is usually at the Zambezi Waterfront. Please note that entrance to Victoria Falls is not included in tour. (B: Lodge). Victoria Falls, Livingstone-Zambia. After breakfast the safari arrangements end. Before proceeding with onward arrangements, guests might want to partake in the numerous optional activities that are available in this adventure capital! (B). While we endeavour to ensure the itinerary runs as advertised, we reserve the right to change this due to unforeseen circumstances or external influences beyond our control. Use of specially modified 4x4 vehicles. Professional Guide and Back-Up Crew. All camping on a non-participation basis in private campsites. Camping equipment. Meals as specified (B-Breakfast, L-Lunch, D-Dinner), mineral water, alcoholic and non-alcoholic beverages, tea and coffee. Accommodation on a shared basis. Botswana National Parks and Game Reserves entrance fees. Open Vehicle Game drives in all National Parks and Reserves. Houseboat en-suite accommodation (Day 1 and 2)Lodge accommodation Maun (Day 3) &Livingstone (Day 10).Flight Maun to Moremi (Day 4) on a shared aircraft basis. All airfares, activities in Maun and Livingstone, any gratuities, any personal expenses, visa fees, departure taxes. Entrance fees Victoria Falls. Travel Insurance (compulsory). Pre and post tour accommodation and transfers. Angebot gilt vorbehaltlich Verfügbarkeit im Festbuchungszeitpunkt. Preisänderungen und Irrtum vorbehalten.